Montana continues to torment me with gorgeous days in the 40s before it kicks back up to nearly 70 again. I am ready for soup and sweaters, dangit. Fortunately this recipe is delicious independent of outdoor temps, so we can enjoy it all year round. I’ve been making whole wheat beer bread for years, largely as way to use up beer taking up space since I don’t care for it in beverage form. Last year while planning my April grilled cheese series, I debated an apple and cheese combination but ultimately went in another direction. (I may revisit this series next April, stay tuned.) However, it reminded me of the perfect pairing of apple and brie, and it stuck in my mind as something to work in another area. With a garage overwhelmed with hard ciders (I am really bad at drinking, guys) and no reason any beer-esque beverage shouldn’t work, I modified it to utilize some of those bottles. My test batch I made exactly as one would with regular beer (well, with less sugar), and was surprised at how much I loved it. With a much more subtle taste than a beer bread, it makes a great side dish for anything where you are looking for a more neutral flavor. Goes great with chicken soup, tomato soup, or anything you’d normally pair with beer bread. If I’m honest, I make this version a lot more often than the beer version, just because it’s so much more versatile in its complements. However I felt I could improve the individual bread experience, and set out to do just that. 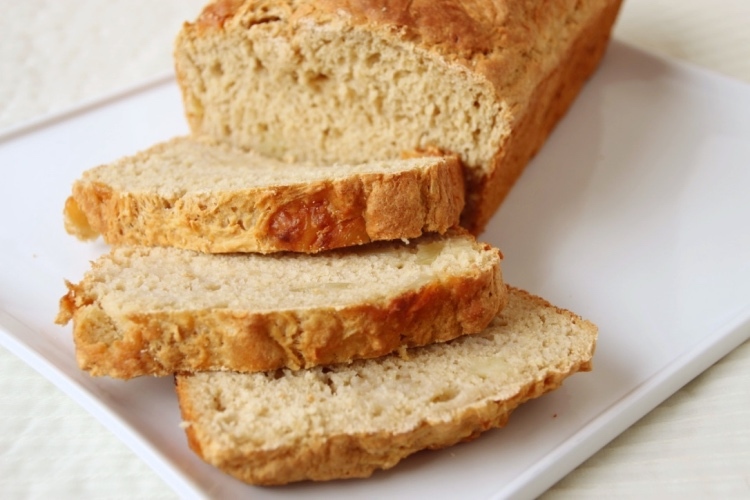 With the addition of grated apple and diced Brie, it turns the bread into something to enjoy all by itself. It’s a wonderful breakfast or afternoon snack, and is delicious toasted and plain, or with a light spread of tart jam or peanut butter. 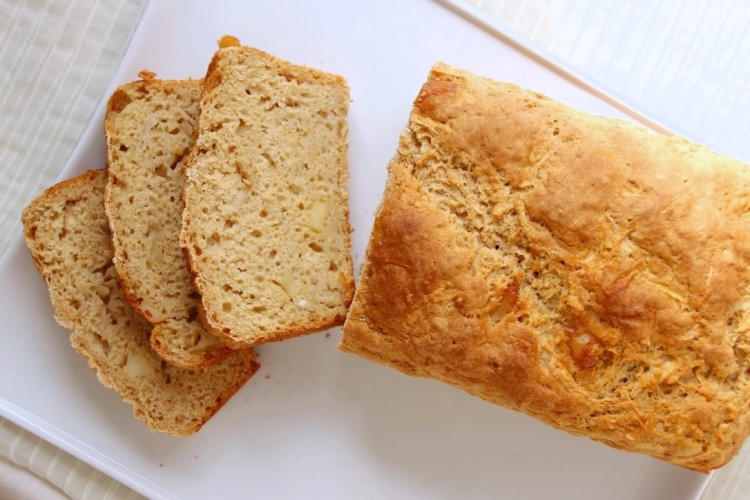 Unlike beer bread, this version also pairs well with tea, which is nice for those of us that don’t drink coffee late in the day (or at all…weirdos). So whether autumn has truly arrived or not, comfort yourself with a tasty batch of cider bread, and toast (wink wink) to the new season. Preheat oven to 350 degrees Fahrenheit and lightly grease a 9×5″ loaf pan. In a large mixing bowl, whisk together all the dry ingredients. Pour in the cider and stir until completely combined. Gently fold in apple and cheese. Scrape into the prepared pan, smoothing the top as best you can. Bake 50-60 minutes, or until a toothpick inserted into the center comes out crumb-free. Let cool at least 15 minutes before slicing. 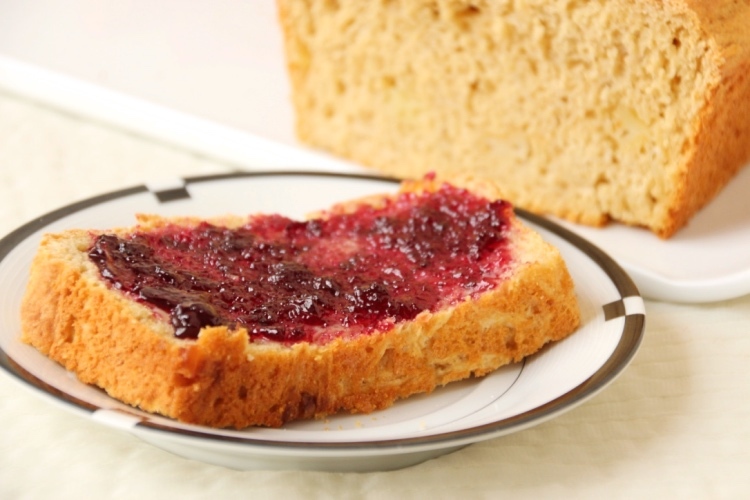 Excellent solo or lightly toasted and spread with a tart jam. I’ve saved my favorite for the last week of National Grilled Cheese Month. An unusual but amazing blend of flavors I hope you all love. One of my favorite cheeses, Brie is often served in both sweet and savory experiences. Baked in puff pastry dough, topped with jam, and served with apple slices, melted into gooey crepes, or enjoyed plain on a cheese board, there’s really no wrong direction to go. Since lately I’ve been loving the sweet and salty combination, I went that route here. Gooey Brie sandwiched with crisp bacon and tart huckleberry jam, this sandwich tastes almost like breakfast (and in fact, I think would also be awesome cooked French toast style) but works equally well for lunch or dinner. With the sweetness of the jam I recommend serving with a decidedly savory side dish, like roasted veggies or a green salad. I chose sourdough bread for its wonderful crispy texture and neutral but tangy flavor, but any white-ish bread will be great. I would personally avoid a hearty wheat or multi-grain because I think the bread would overpower the filling, but obviously that’s completely up to you. Be careful not to go overboard with the jam as a little goes a long way, but if you want to add an extra slice or two of bacon I won’t judge. I kept mine a bit lighter with three ounces of Brie and two slices of bacon, but if you’re looking for an extravagant and indulgent experience, definitely increase those portions. Or if your bread slices are on the smaller side, stick to two ounces of cheese. Brie is quite rich so a bit less can be plenty. Round out your month with a classy grilled cheese (can grilled cheese be classy? I’m going with yes) and a fantastic flavor profile. I hope you enjoyed the series and maybe even found a new sandwich to try. If you haven’t already, cook the bacon. Set aside on a paper towel to drain. In a medium pan (big enough to fit both slices side by side), heat a little butter or oil over medium-low. Meanwhile, spread one slice of bread with huckleberry jam, and top with bacon. Arrange brie in a single layer on the other. Place a lid (or a plate, or whatever you have around) over the pan and continue to cook low and slow until the Brie is melty and the jam is warmed through. Gently transfer the Brie slice on top of the other, and cook an additional 30-60 seconds so the flavors meld. Remove from pan, slice in half, and enjoy immediately. 1 I like this method of grilled cheese preparation because it doesn’t require flipping the whole sandwich, and I think the cheese melts faster, but feel free to use your own preferred method! 2 If you don’t have huckleberry, any reasonably tart jam would work great; try raspberry, blackberry, boysenberry, marionberry, etc.